Earlier this year I attended Bradford International Film Festival where I chronicled the array of movies I saw on this very site. Sadly, due to time constrictions, my writing focused exclusively on feature length films which led to the omission of some rather fantastic shorts including the subject of this post, a poignant and humorous movie which premiered at NoBudge earlier this week. 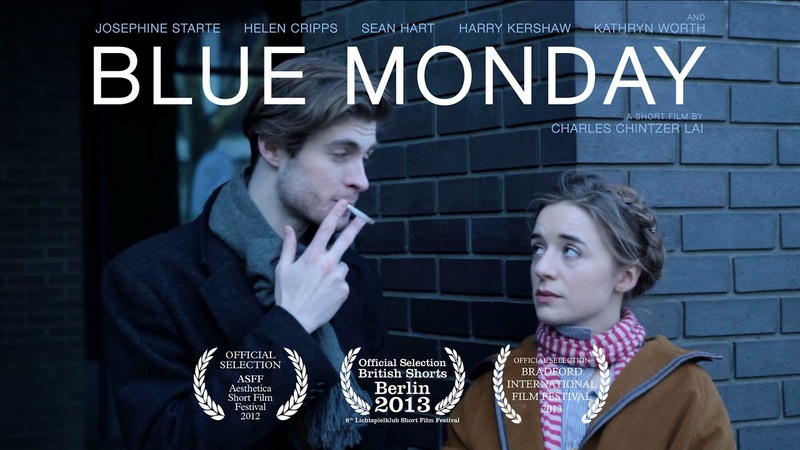 Charles Chintzer Lai’s Blue Monday is a rather witty, close-to-the-bone look at a life with all colour drained out. The tale which plays out on screen, with a dull muted tone bleeding the greys, greens and blues together, focuses on the birthday of a struggling writer named Claire (Josephine Starte). Whilst the addition of an extra year to her age is a cause of much celebration for Claire’s colleagues, the passing of another twelve months hardly seems like something to be gleeful about for our melancholy protagonist. Aside from a much more successful best friend to feel jealous over, Claire's main area for morose introspection comes at the hand of her love-life and her two potential partners - the cool but distant Greg (Sean Hart) and the all too readily available Ethan (Harry Kershaw). Neither, to put it bluntly, seem like feasible long term options. Lai's film captures, with a darkly humoured nuance, the frustrating lives of a generation of people promised the world but, due to a collapsing economy and raised false hopes, suffer the anguish of having missed the boat by the most marginal of degrees - they are doomed to live in the gap between expectations and reality known as forlorn disappointment. Lensed with an excruciating realism, Lai coaxes delightfully naturalistic performances out of his actors and, in particular, Josephine Starte excels as the emotionally vulnerable Claire who, through a combination of alcohol and a dislike of what she sees when she takes stock of her life, makes a series of pained bad decisions which she is bound to add to a laundry list of life regrets when the effects of alcohol wears off. A nightmarish, and nail-bitingly realistic, view of an existence that will be all too chillingly recognisable for a generation of university graduates who find the real world isn't always what has been promised.